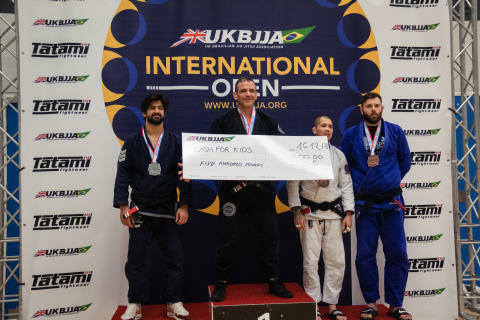 On 16 December 2018, Ravenscraig Regional Sports Facility in Motherwell hosted some of the best Brazilian Jiu Jitsu (BJJ) competitors in the world at the 1st UKBJJA International Open Tournament. 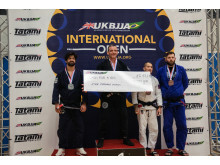 Following an opening ceremony presided over by North Lanarkshire Provost Jean Jones and MSP Clare Adamson, competitors from across Scotland and the UK took to the mats to fight it out with athletes from Brazil, Poland, Norway, Portugal, Finland and more to compete for the top prize of £2000. 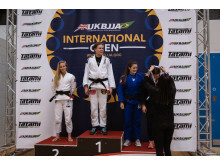 In the end, a hard fought bronze medal from UK’s Samantha Cook prevented an exceptionally strong team of athletes from Finland from having a clean sweep of the women’s black belt podium. Alongside the adult competition, a junior tournament sponsored by Tatami Fightwear allowed rising young stars of the sport test themselves against youngsters from across the UK, as well as meet and fight alongside some of their international Jiu Jitsu heroes.